Here, you’ll find an ever-updating resource for questions related to hand-washing, ingredients, fragrances and other Soak stuff. Don’t see an answer for your question? Just ask, and we shall deliver the answer. What are the ingredients in Soak? What are Carrie and Phil made of? Can you please tell me basic hand washing instructions? Can I use Soak in the machine? Can I use Soak to spot clean? Where can I buy Soak? There are no stores that carry Soak in my area. Are the extra costs because Soak is made in Canada? Will it leak in transit? How do I display Soak in my store? Is our store listed on your website? Do you have any photos of the bottles? Does Soak advertise and appear in the media? Who should I contact for samples/contests/giveaways/promotions? We have the ingredients listed on every bottle. All our formulations are the same except for scentless, which does not include parfum in the formulation. What’s inside: reverse osmosis water, sodium dodecylbenzenesulfonate & sodium laureth sulfate (lifts soil), cocamidopropyl betaine & cocamide DEA (removes oils), parfum, acetylated lanolin alcohol & cetyl acetate & polysorbate 80 (adds softness), tetrasodium EDTA & DMDM hydantoin, benzophenone-4 (purifies tap water), citric acid (balances pH). Soak is environmentally friendly. 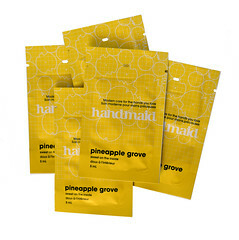 It is biodegradable and packaged in recyclable bottles which are printed with water-based inks. Soak is not organic or all natural. Natural products tend to need to be refrigerated and have short shelf lives. Soak is a stable product that will not fog or separate over time. What is Carrie and Phil made of? They are made from a virgin low density polyethylene to food grade and toy safety standards. The material does not include phthalates. Hand wash: Pour 1 teaspoon into cool water. Soak item for 15 minutes then gently squeeze out water. No need to rinse. Some color may bleed into the water – don’t worry; this won’t harm your garment or yarn. Lay knit items flat to dry. Wash sets (like lingerie) together. Click here for the full article washing hand knits from Knit Simple. Yes. Soak is ideal for either hand or machine washing- including High Efficiency Machines. Use the delicate cycle and measure Soak based on your machine’s instructions. You can either use or skip the rinse cycle, depending on what you are washing. Yes. We recommend using Soak on the end of a cotton swab. Gently rub the dirt/ stain and then rinse with water. 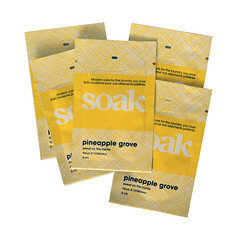 Soak can be found in 1200 + stores and online retailers across North America, Japan, and the UK. You can visit the store locator on our website to find a retailer near you. You can also purchase Soak right from our website by clicking here. We will ship worldwide however the shipping rate does increase if you are outside of Canada or the US. Soak is made in Canada under NAFTA regulations. It comes into the US without any duties or additional fees. All US orders ship FOB Buffalo NY. All bottles have induction seals so that they will not leak during shipping. Your introductory Package includes a free retail display unit. It holds 2 of each fragrance and 2 starter kits. You can continuously refill it. The display is designed so Soak takes up minimal counter space and is stylishly contained. Yes, we have a dynamic database of all of our stores on our website. If your store isn’t listed, please send us a quick email and we’ll get it up there. The database will show your address, a map link, your email and website, if available. Call us or email if it isn’t there. We have a Flickr site that allows you to download hi-res Soak images. We encourage you to use any images, photographs or product descriptions of our product on your website, in your newsletters or in your store. We’ve done the hard work, so you don’t have to. If you are new to Flickr, you can read this blog posting to learn how to save the images right from Flickr. Yes. Soak is advertising in both trade and consumer magazines in the knitting and quilting market. Soak constantly appears in editorial coverage from all major knitting, quilting, sewing, weaving, spinning and craft magazines. Ngoc is our marketing coordinator and will be happy to assist you. You can email her at ngoc@soakwash.com.